We at Dolphin Scuba Center are dedicated to staying on the cutting edge of spearfishing technology. We carry spearguns that cover all ranges of the sport, from simple polespears to blue water tuna guns with float and floatline systems. We can outfit you for taking any game in any waters, from the Northern California Coast to the warm waters of Baja, Caribbean, or the South Pacific. The polespear is simplicity at it's finest. Dolphin carries five, six, and seven foot fiberglass poles with paralyzer tips. We also carry break-down travel polespears that disassemble into three two-foot sections. The breakdown pole has a threaded tip which allows you multiple tip choices, from tridents for cave hunting to break-away tips that will hold very large fish securely. The pneumatic gun is an air charged gun that uses air pressure to propel the spear. The gun has a charged piston chamber that does not lose pressure when shot, allowing multiple shots before recharging with the supplied air-pump. These guns are more powerful than band guns of the same size. They are excellent for cave hunting as there are no bands to rub against the rocks. They also allow the diver to grasp the gun by the barrel without the fear of the bands snapping on his or her hands. Band guns, however, have the advantage of being rugged, able to take more abuse on the shafts, and are easily fixed with a replacement band. The longer band guns will shoot farther with more accuracy and penetration power. Dolphin Scuba sells the JBL .38 Special, a triple-band mid-size gun with an aluminum barrel that is tried and tested on the Northern California Coast. Dolphin Scuba also sells Mares Euro-guns with Tahitian flopper shafts in 55cm, 75cm, and 90cm lengths. These guns rule for long range shots with deadly accuracy. 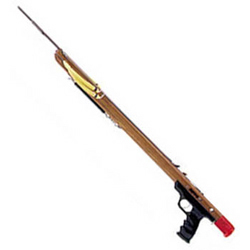 Dolphin also carries Riffe Spearguns, considered by many to be the best in the world. Jay Riffe makes guns that have taken World-Record fish. The MetalTech Series is a foam-filled aircraft grade aluminum stock that has a distinct toughness around the reef or rocky bottom. Riffe's Teak guns are laminated Teakwood and float when the spear is discharged, making it an excellent gun for freediving. The Teakwood absorbs the noise and vibration from the trigger mechanism making shots of up to 35 feet possible without spooking the desired target. Dolphin Scuba also stocks a wide range of accessories for Spearfishing, including tips and bands, shooting line, carry bags, fish stringers, floats and floatlines. A complete line of Abalone diving gear and freediving equipment can also be found here. Let us meet your needs and fill your brain with the years of experience our staff has. If you have any questions or inquiries, give your Dolphin professionals a call at (916) 929 - 8188.